← Should cats drink purified water? Your cat howling at the water bowl is not uncommon it seems to me because there are a lot of posts on this particular topic on the Internet. Invariably the cat’s owner is trying to find answers. They rarely succeed because I have seen a multitude of possibilities but nothing that sounds true to me. Why do cats walk up to their water bowls and howl? An interesting aspect of this peculiar problem is that all the discussions are about cats howling in front of water bowls and not food bowls. The key may be in the fact that the trigger is water. Water is an excellent conductor of electricity while food isn’t. Please see static electricity charge discussion below. Cat howls at water bowl. I am being facetious because this could be serious. Photo by K e v i n on Flickr and published under a creative commons license. Howling before drinking would indicate that the cat is concerned about feeling pain while he drinks. If that is true then something is causing the cat pain while he drinks. What might it be? There are several potential answers, perhaps too lengthy to discuss here. One is that he feels pain because he has poor oral health due the gum disease and teeth in poor condition. Cold water would be painful to drink. This is supported by the fact that a lot of these cats are elderly with a higher chance of poor oral health which is tricky to spot. Also howling is not uncommon among elderly cats and is generally considered to be due to confusion which in turn is due to perhaps early-stage dementia. Not a lot has been written about feline dementia. There is no reason to suggest why it should not exist as commonly as in the human population. We know that air pollution is a major issue in today’s world. A lot of cats are outdoor cats breathing the same air. Studies have linked air pollution with dementia. Another possibility is that the cat receives a static electricity shock when his whiskers touch the edge of the bowl. Perhaps the bowl is made of metal. As mentioned, we know that metal and water are good conductors of electricity. Perhaps the cat has charged himself while walking over the floor or more likely he has gained a static charge because he’s been petted or brushed by his owner. When he puts his tongue into the water the charge is discharged through the water via the tongue or the whiskers and he feels a slight shock. He is howling in preparation for that shock. It is a statement of his distaste of what is surely to come. If the floor where the bowl is located is of a synthetic material then it is possible a cat can gain a static electricity charge while rolling around on it or even walking on it. 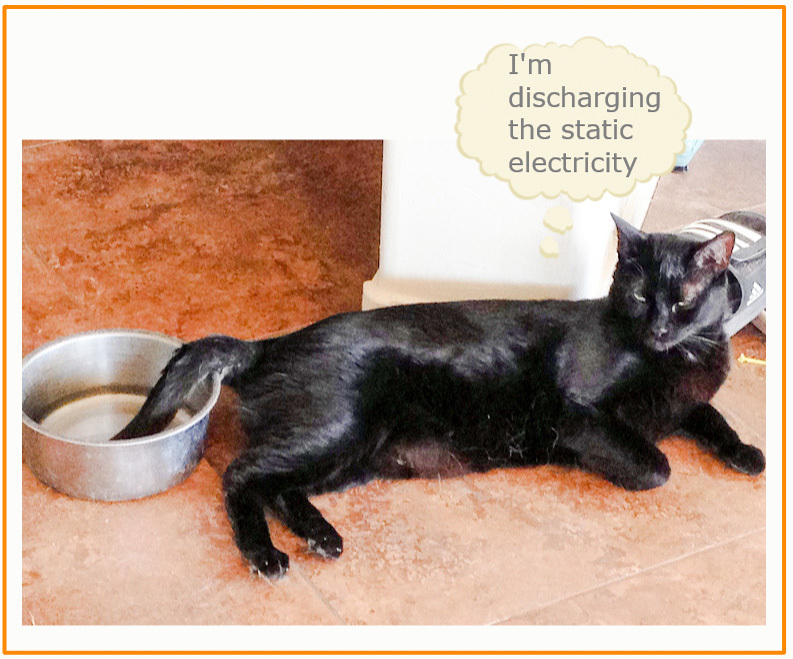 It may be possible to stop the discharge of the electricity from the cat through the water by placing the water in a ceramic water bowl and placing the bowl on a fiber mat (a material which does not conduct electricity). These are my thoughts. I have racked my brains. There is nothing in the books that I have on this particular problem. And, as mentioned, the Internet was unhelpful to me. If you have some good ideas, I would very much appreciated if you would write a comment. This entry was posted in water and tagged Cat Dementia, Cat Drinking Water, cat sounds, cat water bowls, cats and water, howling cat, oral health by Michael Broad. Bookmark the permalink. I had never thought of static electricity as a culprit for this phenomenon, but it seems very likely to be an explanation. The dread of impending pain can be so traumatising. We all know how much a static blast hurts, but in the mouth – I can’t think of it without wincing. I will root out another big ceramic bowl & replace one more of the 6 bowls (4 metallic) in the home. It will be interesting to see if the new bowl becomes a favourite. I will keep you posted. Gail, your cats seem to have trained you perfectly! I have some metal bowls too. But he never howls. I think I am okay. Hope you’re well Jane. Static electricity seems to be the most likely culprit IMHO. Our cats’ water bowl is ceramic and although it’s on the 1st shelf of a metal shelving unit in the kitchen, there is a place mat between the bowl and the metal shelf. The other thing one must keep in mind is that the bowl should be wide enough to accommodate the whiskers. I’ve witnessed cats yowling because their bowls were too small and their whiskers would get wet and they didn’t like it. My own cats also get vocal if the water’s not fresh or has cat hair in it. Pretty funny. Thanks Gail for your excellent comment. Very useful.